In this edition of TheBigRetort we had hoped to bring you the answer to the question to which you have all been waiting: Did he or didn't he? 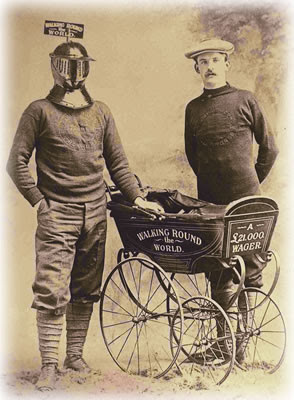 It began with a 'Wager', widely published in various media around the world, and possibly everyone and his dog - even those wizened moguls of Hollywood - now lay claim to the belief that Harry Bensley, the Man in the Iron Mask, walked around the world pushing a perambulator - for $100,000. The bet was placed by John Pierpoint Morgan and the Earl of Lonsdale. So it must be true, mustn't it? Bensley claimed that J Pierpoint Morgan called off the challenge due to the onset of the 1st World War - which started after he in fact died. Much of our knowledge of Bensley's exploits come via a website with a family link. "Later in life he fell very ill. It was only now this his illegitimate son (Jim Beasley, my grandfather - Mother's side) found out about his father (Harry) and met him several times in Brighton hospital. (Apparently they looked almost identical.) Jim found him too late to be able to help, and Harry died in 1956, three months after their first meeting, back at home in his bedsitting room at 42 Riley Road, Brighton. Kate (his wife) was with him." Harry Bensley's 'achievement' was represented by the Beasley/McNaught family, who claim their father/grandfather "Henry Claude Beasley" - not 'Bensley'? - was Harry's illegitimate son, born in 1908. This individual was referred to as "Jim" and is said to have tracked down his father (Harry Bensley) almost on his deathbed and then related details of that meeting to his own daughter. However, "Henry Claude Beasley" appears to be a totally different individual, with no known association to Harry Bensley; not even the same surname. So why did Harry Bensley not complete his march around the world? "... on reaching Genoa, Italy, in August 1914 and having covered 30,000 miles, with only six countries left to visit and 7,000 miles left to walk, the First World War broke out. Once again, there are conflicting reports of what happened next: (1) Being patriotic, he returned to England to fight for his country." "(2) Morgan, worried that his steel empire would be threatened by the outbreak of war, called off the bet. Harry was said to be devastated when Morgan's messenger (or telegram in one report) reached him with the news, and he returned to England, a devastated man. He was never to leave our shores again." To be fair, the McNaught family acknowledge that J P Morgan died a year before the war, so he could not have 'worried' about the threat, and it seems strange to stress the claim in spite of it. To straighten the record, the (only) gentleman ever referred to in contemporaneous accounts was (initially) described as 'a well-known American millionaire...' The site's author, who expresses some doubt on the manner of the wager, says: "Choose which version you believe." 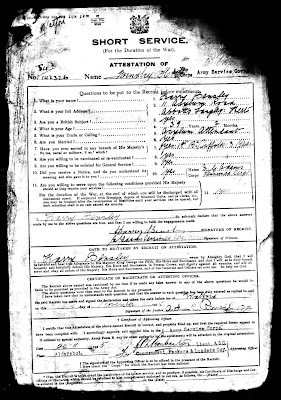 It also goes on to claim.... 'He fought in the army, but was invalided out after a year.' [In fact, according to the Short Service Attestation signed by Bensley (under oath) it records three months service only, in a depot at Aldershot with the 'Packers & Loaders Company'. If we are to believe the myth, Iron Mask, having crossed through 10 countries - from the 1st January 1908 to the outbreak of war in August 1914 - after his receipt of that devastating telegram from a dead man (in Genoa, Italy) had, in 6 plus years or 80 months, with no time off for good behaviour, managed a mean average of 375 miles a month, or twelve miles a day around the planet. With a further '7000 miles left', he may have circumnavigated the globe for a journey that would take a further year and a half - if not for the War that is. Truly a remarkable man. Even Harry Bensley's 'descendants' express doubts. "We have never seen evidence that he left Britain, and because no one knew who he was, he could have quite easily carried on living here." Following, in TheBigRetort... the whole truth and nothing but... Or Harry's version of it. Following a journey from the centre of London, after passing through Woolwich, the Iron Mask and his unnamed companion continued on to Bexleyeath. Things had gone extremely well and so they decided to stay the night at the Upton Hotel. The next morning however disaster struck... As they sold their wares at the Broadway they came under the 'unsympathetic' gaze of a police sergeant. Seemingly the only man in England who could spot a 'con' at twenty yards, PS Martin later told the court that he saw the defendant selling photos and pamphlets. He asked if he had a certificate and the defendant said 'No, I don't go from house to house.' Witness said 'You go from town to town,' and defendant said 'Yes.' The Iron Mask was then taken into custody. That night, the 3rd January, allowed bail the Mask and his companion stayed at the George and Bull Hotel to await his fate. The trial, which would be heard in the morning of the 4th had been brought forward a week by considerate Dartford magistrates. "To suit the convenience of the globe trotters." The Time: 3rd January, 1908, 1pm. The Place: Dartford Police Court. "'Henry Mason' was called, and a voice from the mask replied 'That's my name, sir,' " the court reporter wrote. He continued... "He was charged 'that on the third of January of this year, in the Parish of Bexley, you unlawfully did act as a pedlar without having a certificate authorising you to do so.' The magistrate inquired if the man was bound to keep that mask on. Mr Clinch (for the Prisoner) said he was going to ask the Court's indulgence 'by and bye'. He was going to ask the magistrates to allow the man to wear the mask during the trial. He pleaded guilty on his behalf to the charge." A mystery inside an ancient mask. As he appeared in the main streets he was treated like the Edwardian equivalent of a superstar. The question on everyone's lips: Would he remove it. The court reporter recorded dryly... "The magistrates apparently saw the humorous side of the affair, and the strict lines of Court routine were allowed to become unusually elastic for the occasion." 'Henry Mason' stood in the dock awaiting his fate from behind the confines of an iron helmet. He was quite fortunate... Had the magistrates known who really stood before them the helmet would surely have been exchanged... for iron bars. Mason of course was not his real name. Iron Mask - quite craftily - had put forward this 'nome de convenience', if the bad French may be forgiven, in place of his own.... Harry Bensley. It was a remarkable performance of deception and revealed what a master manipulator he was. "He had given a certain name but he was sure it would not influence the Court one way or the other," Bensley's lawyer said. (In other words the name given was not really his.) The court transcripts published in the same paper reveals the astonishing depths of Bensley's chutzpah. The Chairman: As far as the name is concerned, we are not anxious to know the (his real) name. Mr Mitchell: Wearing a mask is part of getting his living is it? Mr Clinch said it was not part a question of a 'living' but it would take too long to explain. Clinch elaborated on the conditions of the wager and explained why he was selling the postcards at Bexleyheath. He started from London and went through the Strand and other thoroughfares in London and was not bothered by police. The police too took interest in his venture and purchased some postcards. Mr Clinch: I believe not, but they were interested. Clinch referred to 'No 10' of the conditions. This stipulated that the mask should be worn in public places. The court room was such a place and it was 'imperative' to the masked man to preserve this restriction. The Chairman: If we told him to take off the mask it would be an end of the whole business? The Chairman: We will allow the mask to remain under the circumstances. The Chairman said that the mask would not help him much. Mr Mitchell: Wouldn't he have a better chance at Gravesend (laughter). Mr Clinch: I should be nearer home. I might be able to find him one there (laughter). Whether or not the wager commended itself to the Bench, it was clear that the man had not the slightest intention on infringing the law. He started in a busy place like London and was not interfered with. He asked the Bench to deal leniently with him, and suggested that considering the special circumstances justice would be met by ordering the man to pay the costs. He expressed his thanks to each magistrate for coming there and holding a special court to suit his convenience. He would not like them to go away without assuring them that he fully appreciated their consideration. If they would like to see photos he had some there. Mr Mitchell: We've got the genuine article (laughter). Mr Clinch: That's something better. The Chairman asked about these photos. The gentleman there who was going with the defendant seemed to have a certificate, while the other had not. Did the goods offered for sale belong to the masked gentleman? Mr Clinch (cautiously) : I never like to dive into these things too closely (laughter). I should not be surprised if this was not a joint speculation. Mr Mitchell: Is the perambulator to put his wife in when he finds her (laughter). Coming soon from TheBigRetort... how Harry Bensley came up with the idea of the Iron Mask Wager, from his prison cell. The Iron Mask: Day 1. To recap... the year was 1908. On a foggy New Year's morning. At 10.30 precisely, a man wearing an iron mask left from London's Trafalgar Square pushing a perambulator full of photos and accompanied by an 'American' minder. These were just a few of the conditions set down by 'the Wager '. But what happened after this event? Did Iron Mask get arrested for flogging his goods? Did he make it around the world in 6 years? TheBigRetort brings you some of the detail.... and the devil in it. Having left the centre of London, the fog had lifted. The Man in the Iron Mask headed south across the River, his companion acting as Tonto to the Lone Ranger. Every street on the way was said to have been 'thronged' with excited crowds. Several newspapers had been alerted to 'the Wager' and there was much clapping and cheering and waving. To the man inside the helmet it was hard going - and bewildering. But the people clamoured for the postcards. A blur of faces and monotonous sound came in and out of vision through the visor. "We did not taste a mouthful of food, or even a drop of water, from the time we had our breakfast - 7.30- till 9.30 in the evening." The Masked Man, on his first day of 'the Wager' . By the time the cavalcade of two reached Woolwich many postcards had been sold. And Harry Bensley, or rather the Man in the Iron Mask, had entered legend. It was 'A Remarkable Wager': TO WALK AROUND THE WORD, MASKED, PUSHING A PERAMBULATOR - FOR $100,000. Having passed through Woolwich, the same paper informs, 'The Iron Mask' arrived at Bexleyheath with his companion. They stayed for the night at the Upton Hotel. It was Thursday, 2nd January, one day after their epic journey had commenced. The same paper opined with remarkable prescience, "He was optimistic of being able to accomplish his self imposed (sic) task, but whether he will find it congenial in a few years time especially in traversing hot countries, remains to be known." Coming soon in TheBigRetort.... "THE TRIAL OF IRON MASK". In Edwardian England a man accepted an incredible wager: the prize - £21,000. It was set down by two notable men, J P Morgan (the wealthy banker) and the Earl of Lonsdale. 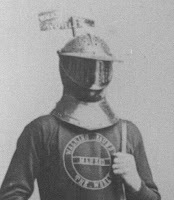 But following several sightings around various cities and towns, "Iron Man", who pushed a pram 'throughout the world', face covered in an iron helmet, surviving only on the sale of pamphlets and postcards, disappeared like a phantom. Only to return 6 years later having 'nearly' completed his remarkable odyssey around the globe. The story of The Man in The Iron Mask captured public imagination, then and now, and today people the world over are searching old newspapers and dusty archives in an effort to trace the footsteps of this intrepid perambulator. Four years before he took up his remarkable challenge, in 1904, Harry Bensley, then described as age "29", a labourer, appeared at Willesden Magistrates Court. Charged (on remand) with obtaining various sums of money 'by false pretences', the details of his arrest were indexed in the Times for various dates from September to November. This the first time the 'full' story of Bensley's escapades have been presented to a gullible public... and it makes shocking reading. Bensley had claimed that he was the son of one Sir Robert Burrell, and as such was heir to extensive estates in Norfolk. He also made the claim that he was heir to his godmother's estate, also at Thetford, Norfolk, the late Mrs Holland. On his thirtieth birthday Bensley let it be known that he was due to inherit an impressive property and the thousands of acres of land that came with it. But there was one problem... or so Mr Bensley confided to his victims,. If he attempted to raise money against the value of his future inheritance then 'the whole of the estate fell into the hands of the trustees'. By curious but timely coincidence, Mr Jordan (the victim of Bensley's scam) received two telegrams from the moneylender himself. This was most curious. Mr King offered him sums of £50 and £100 if he would 'induce' Bensley 'to accept this offer and a second one of £1000'. And then there was Bensley's sister...? Bensley reeled his 'marks' in like two haddock on a fishing line. Messieurs Jordan and Bradley duly lent the money... but without surety. Bensley had instructed them to destroy any IOUs as these would stop his inheritance. Eventually nothing was heard from Harry Bensley. A visit to Thetford resulted in the police being called in. The claims were bogus. Harry Bensley was a well-practised fraudster with no regard for his victims or their families. "Jordan and Bradley had been defrauded of their lifelong savings and their provision for their children," the Times reported. 'Mr King' the moneylender did not exist. There was no relationship between Bensley and Robert Burrell (who was indeed wealthy, very alive, but had not received a knighthood). In what must have been a classic version of a long-firm fraud, Jordan and Bradley had been scammed. Unknown to his victims Harry Bensley, using the alias "Harry Barker", had preplanned the whole thing, as far back as 1903. By the 17th May of the following year he had set sail on a ship headed for Sydney. Bensley had purchased the tickets, one for him and the others for his wife and child, with the first tranche of money he had taken from Jordan. This remarkable and elaborate deception, which revealed a degree of prescience found in a sociopath, had taken a year to complete, involved his 'wife' who was a seamstress, and was commenced by the same man who four years later would announce to the world that he had accepted a remarkable challenge, an astounding wager, (amongst others) to walk 'through' world, always wearing an iron mask, pushing a perambulator, picking up a wife, peddling photographs and pamphlets of his 'planned' endeavours - whilst keeping his identity secret. As we shall later discover there was a very good reason for this. On completion of this mammoth six-year task Harry Bensley was set to win an astonishing $100,000... a fortune back in those days. Or at last that is what Bensley claimed, for whatever Harry claimed should always have been taken with a (huge) pinch of salt. In fact, like all good tales there was (and is more) than meets the eye to this franky modern myth. Besides being a conniving, and rather nasty fraudster, Harry Bensley, a labourer and no more, was also a wife 'deceiver'. Sometime at this juncture, Harry Bensley had made the acquaintance of a barmaid in Norwood called Lily Chapman. (Listed as "Clapham" in some documents.) Ironically, it was a bigamous marriage to Lily that would catch up with Bensle. But that was after he absconded with Jordan and Bradley's money. Mr Bensley had presented himself as bachelor and heir to a large estate at Thetford to unsuspecting Lily. The modus operandi of the career criminal following its traditional agenda, Harry married Lily under the bogus surname "Burrell". Of course the representations he had also made to Lily were untrue, as indeed were those he would go on to make to Messrs Jordan and Bradley much later. He compounded this deception, the false pretences, by committing bigamy. He was still after all married to Kate Green. Another false representation that was soon to catch up with him. The ship arrived at the Cape on the 4th June and a reception party awaited. Harry Bensley, son of a sawmill worker at Thetford, was 'nicked'. Brought to book by Detective Sergeant Cole and Detective Inspector Pollard, the prisoner was sent by Willesden magistrates to the Old Bailey. Finally, his deceptions had caught up with him. (Presumably he had more form as 'previous good character' is not recorded in any reporting on the trail.) Harry Bensley, aka Burrell, aka Harry Barker (etc) was sentenced to 4 years penal servitude. Significantly (or so it must surely seem later) he responded to the Common Serjeant at the Old Bailey, "Thank you, my Lord. I deserve it." Perhaps the first time that Harry Bensley had issued a truthful statement. To follow in the TheBigRetort's buried news series, something the 'experts' and national newspapers missed completely... Iron Mask: The Truth Revealed.